Weather is a determining factor in Sea-Doo touring and destination cruising. Obviously, optimum cruising occurs on a hot, sunny day with little wind and not a cloud in the sky. I’ve had my fair share of these glass surface days when my Sea-Doo etches a virgin line across a mirror of water. I’ve also had rides I’ve decided to cancel because of predicted thunderstorms or too high winds. Believe me, you never want to be out when severe storms are imminent. No ride is worth putting yourself in potential danger. 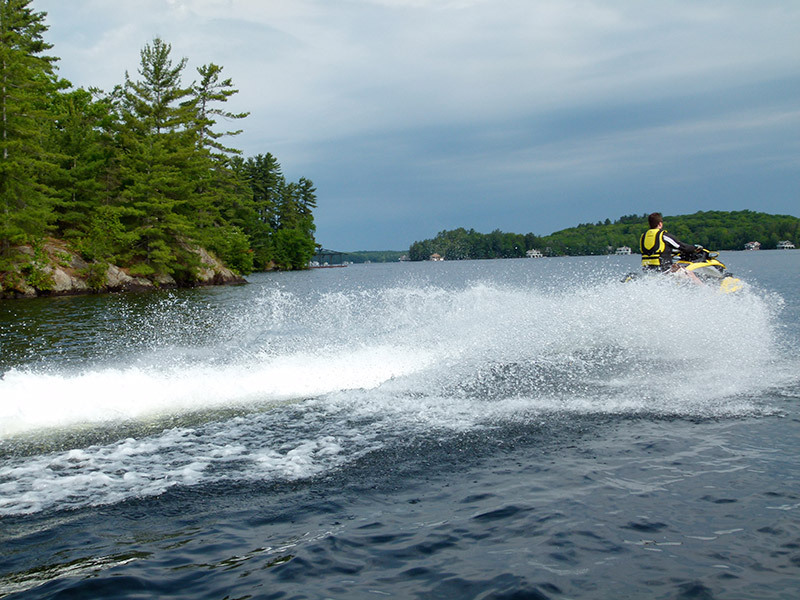 If you are out and the sky goes black and ominous, seek shelter quickly, preferably at a marina or cottager’s dock, where you can get off your PWC onto solid ground until it’s over. I just wish the weather folks would get it right more often, or even agree with one another on one forecast. Basically, I’ll go on a day tour if the chance of rain is 40% or less. Anything over 50% and that day’s ride occurs near my cottage where scrambling home is an easy option. Sometimes, rain is predicted for later in the day. That’s when I’ll choose a quick, half-day excursion (early mornings are normally the calmest time of day) and hopefully, be off the water by noon or so. I also watch the wind closely. Higher winds mean higher waves. They can slow my ride or make it difficult, especially on big water. On windy days, I’ll choose a more protected route like a river or other narrow waterway. The direction of the wind is also important. If the angle of your selected narrow waterway coincides with the direction of the wind, say both running west to east, then that can really whip up the waves along that narrow space. Temperature is another factor to watch. For me, if the mercury is 22˚C (71.6˚F) or less, it’s a long sleeve and pants or even a wet suit riding day. I’ve Sea-Doo’d when it seemed that ice would start forming on the surface and I’ve almost had heat prostration from being out all day in a 33˚C (92˚F) clam bake, with me as the clam. But mostly, the weather cooperates when I ride because I’m on top of it. My point is that for day touring and destination cruising, you need to be more weather aware. In upcoming blogs, I’ll chat about what to wear in various conditions to keep your Sea-Doo ride enjoyable. Talk to you next time!